Superbugs could claim the lives of 10 million people each year, as well as hundreds of trillions of dollars by 2050, a new report has warned today. Vicious infections resistant to drugs already kill hundreds of thousands of people across the globe every year. But a review by economist Jim O'Neill claims the trend is set to get worse if urgent action is not taken. Mr O'Neill heads the Review on Antimicrobial Resistance, which was set up in July by Prime Minister David Cameron and publishes its findings today. Antimicrobials are a class of drugs that includes antibiotics, antivirals, antiparasitics and antifungals. The report cites an example of E.coli that has now become resistant to the last-resort antibiotics, carbapenems. It said there are no effective drugs currently available to treat patients with that strain of the disease. Mr O'Neill said the review team, which based its analysis on work by researchers RAND and auditors KPMG, will search for 'bold, clear and practical long term solutions' to tackle the problem. Further papers will be published in the coming years looking at various ideas including the potential for the use of alternative therapies and boosting the development of new drugs, before a final report in 2016. Mr O'Neill stressed the importance of nations across the world working together to avert the potential economic and health crisis. He said: 'Drug-resistant infections already kill hundreds of thousands a year globally, and by 2050 that figure could be more than 10 million. 'The economic cost will also be significant, with the world economy being hit by up to 100 trillion US dollars (£63.6 trillion) by 2050 if we do not take action. In 1928 a piece of mould fortuitously contaminated a petri dish in Alexander Fleming's laboratory at St Mary's Hospital. It produced a substance, later called penicillin, that killed the bacteria growing in the dish. Twelve years later Fleming and others had taken this finding and created the 'wonder drug' of their time, which could cure patients of bacterial infections. Further antibiotics were developed, revolutionising healthcare and paving the way for many of the most notable medical advances of the 20th century. The breakthrough meant illnesses like pneumonia and tuberculosis, which until then had been deadly, could be cured. A small cut no longer had the potential to be fatal if it became infected, and the dangers of childbirth and surgery were greatly reduced. In recent years, advances in antiviral medications, have transformed HIV from a probable death sentence into a largely manageable lifelong condition. But bacteria and other pathogens are constantly evolving to resist new drugs. Resistance is increasingly becoming a problem, because the pace at which scientists are discovering new antibiotics has slowed drastically, while antibiotic use is rising. It is a problem not solely confined to bacteria, all microbes have the ability to mutate to beat drugs. The great strides made in the past could be reversed, with diseases including malaria, TB, pneumonia once again spiralling out of control. He told BBC Radio 4's Today Programme, 'whatever we do in the UK, we are not going to solve the problem on our own', adding that the picture 'gets bleak' if the world does not take steps to counter the problem. As well as stressing the importance of international cooperation, he suggested that an 'innovation fund' could help with the huge costs involved in developing new medicines. Politicians and scientists have warned of the need to find a cure for infections that have become resistant, with Mr Cameron this year stating it was a 'very real and worrying threat' that could send medicine 'back into the dark ages'. Professor Dame Sally Davies, chief medical officer for England, said the latest research is 'compelling'. She said: 'We all know that antimicrobial resistance (AMR) is important. 'This is a compelling piece of work, which takes us a step forward in understanding the true gravity of the threat. 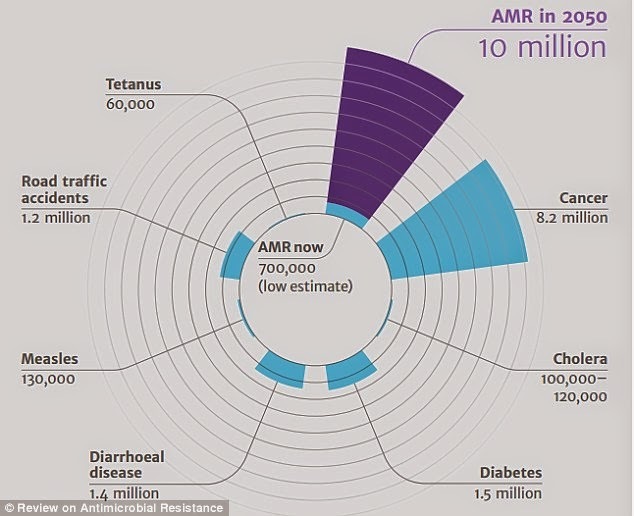 'It demonstrates that the world simply cannot afford not to take action to tackle the alarming rise in resistance to antibiotics and other antimicrobial drugs we are witnessing at the moment. Professor Anthony Kessel, director for International Public Health at Public Health England, said 'if ever we needed a reminder of what a public health catastrophe looks like, then this has to be it'. 'Stopping resistance developing should be straight forward: prescribing the right antibiotic for the right infection for the right time and stopping infections spreading by practicing good infection control,' he said. 'However, in reality this can be difficult to achieve, particularly in countries where antibiotics are freely available or there is lack of sanitation and healthcare is limited. 'For bacteria, the development of resistance to antibiotics is a natural evolutionary process in terms of survival.